This should be taught in school, but unfortunately just like most important life skills, it is up to us to educate our children and each other, so make sure you SHARE this! The plant is called 'giant hogweed' and its pretty white flowers can be quite alluring, but whatever you do make no mistake touching it! Kids are especially in danger due to curiosity. This might come as a surprise, but there are only about 10 plants in North America (not including fungi) that kids need to know to steer clear of. Currently, kids are too busy preparing for and taking tests, something nations excelling at education such as Finland don't do (source), rather than learning practical knowledge such as how to identify poison oak or worse, hogweed! 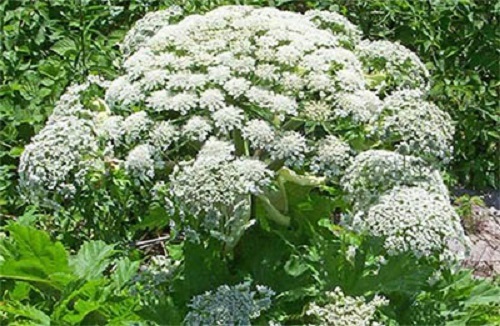 Interestingly, the giant hogweed is part of the Carrot family and can grow up to 14 ft tall loaded with deadly toxic sap! The results of merely brushing up against it are horrifying. If you accidentally break a stem or touch any of the sap you will begin to develop grotesque blisters! Due to the height of the stalk this is easy to accidentally do. Characteristics to watch out for include green stems with purple patches that are a bit hairy with white hairs. If you come into contact with the plant's sap you can expect sever blistering, possible blindness f it comes into contact with your eyes and possible third degree burns. These effects come from the type of chemicals that it contains. When these chemicals come in contact with human skin they dramatically increase the skins sensitivity to light. This can cause blisters that are actually very painful and form within around 48 hours and can last from anywhere between a few months to six years. It can cause LONG TERM sensitivity to light if the sap gets in the eye. Obviously you want to avoid it in the first place but what if you happen to come in contact with giant hogweed? Immediately wash affected area with cold water. Make haste because the toxic reaction may begin within only 15 minutes and make sure you get out of the sun! Apply a safe sunscreen on the effected area ASAP. It's always good to have some of this excellent DIY recipe on hand just in case. In the unfortunate event that the sap comes in contact with your eyes, immediately flush with water extensively. Then be sure to wear sunglasses for protection! In recent weeks, New York State's Department of Environmental Conservation and the state of Massachusetts have issued detailed public warnings about the plant and the serious problems caused by coming in contact with it. These two states are not alone. In the northeastern region, Vermont, New Hampshire and Maine are all reporting sightings of the plant. Maryland, Virginia, Ohio, Pennsylvania and Michigan are sending out warnings. 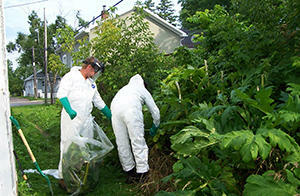 Out west, Oregon and Washington have seen giant hogweed spreading. If you do spot it you have the option to report it to the EPA (US Environmental Protection Agency) hotline – 1-800-424-8802 or your individual state agency as suggested. 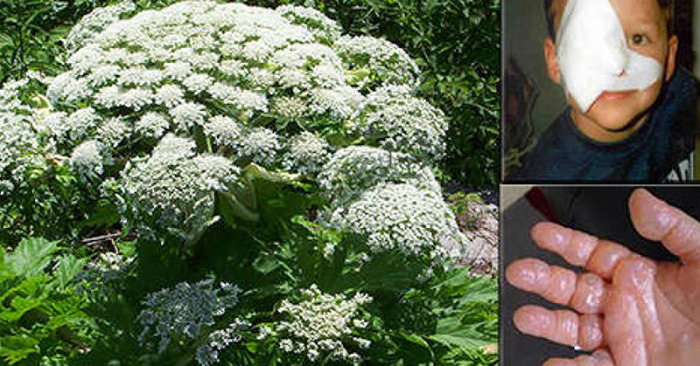 Officials warn not to remove the plant yourself or may risk spreading seeds.